This piece was meant to be part of my portfolio update. In the end it turned out differently than expected and I decided to share it here rather than add it to my portfolio. I decided to finish all illustrations in the future, even when there are painting mistakes or if I do not like it anymore all of a sudden. Every illustration is part of my development and I can learn from it. And sometimes a painting can change so much in the process, that it turns out fine in the end after all. This has happened several times already and is a welcome surprise. 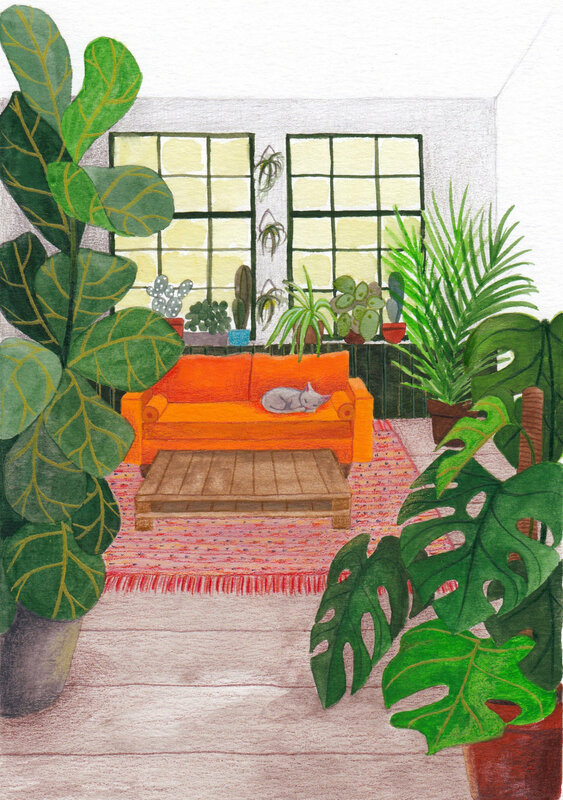 Anyway, I wanted to share this illustration with you, so I can show you what my dream living room looks like. I love plants and cannot have enough of them. Also the colour combination is such a dream. And of course a velvet, orange couch.